Why must all things good come to an end? No - Seriously. A Wendy's in Canada had been offering the 9 patty "T-Rex" burger until everyone on the internet got all internety and kept talking about it. 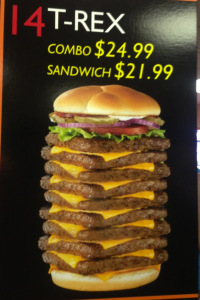 Once word got out, Wendy's pulled the 3,000-calorie creation from their menu. Happy with yourselves, internet people? Maybe next time Wendy's should take a page out of the best fast-food restaurant's playbook. I dont think i can even finish that! lol Yummm!